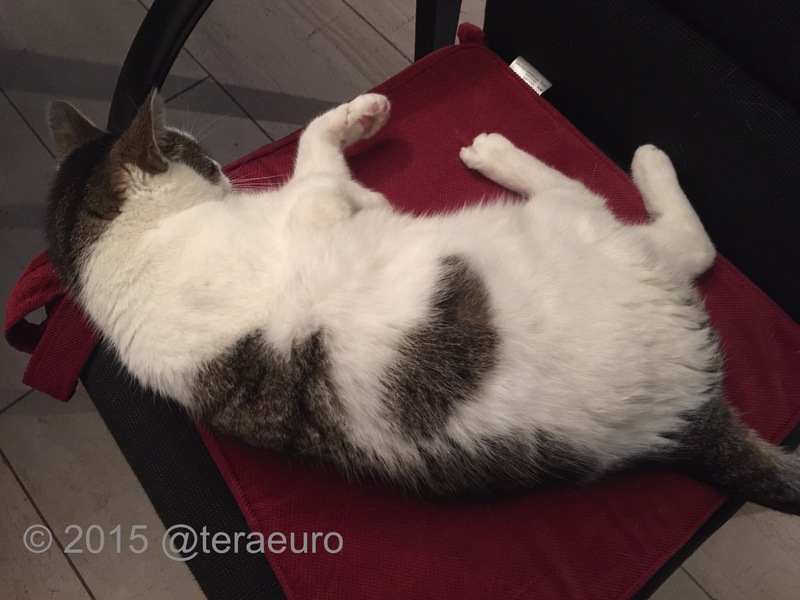 Moin friends, is´s been some since our latest guest blogpost here. Me is very happy to welcome my twitter friend InokumaT here ( I am still tempted to call her Lani) . She send me her adoption stories, lovely pics ( and some more;). 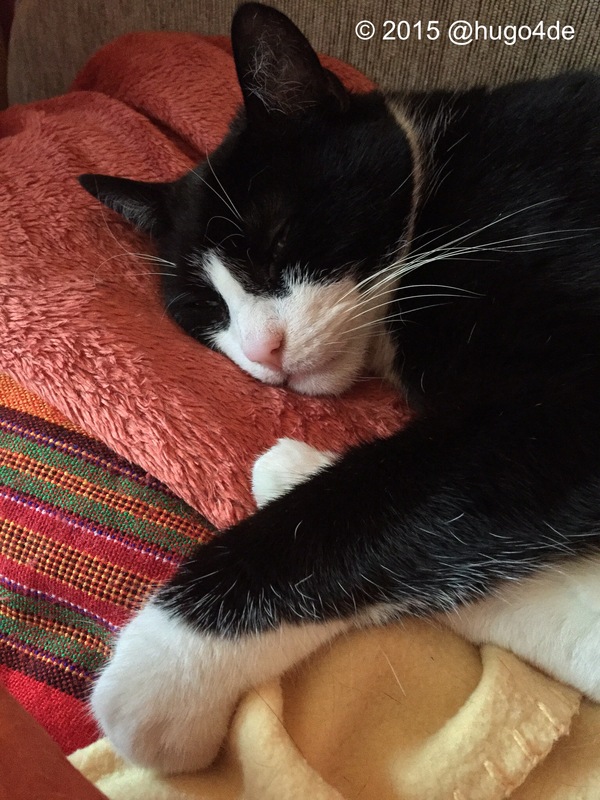 It is no easy-to-read story, since 2 of her lovely cats already went over the bridge . 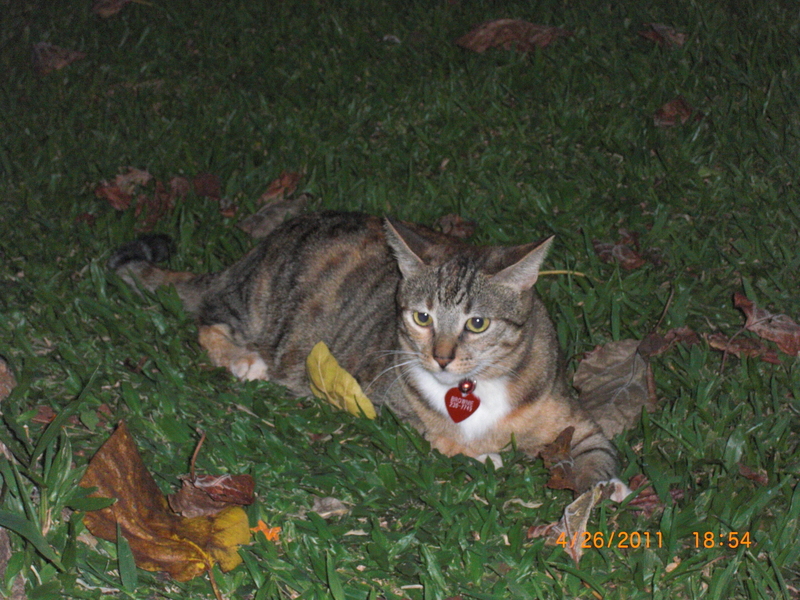 I met Brownie on December 1, 2009 when I first moved to Kapolei. She moved in with her owners next door the same day. 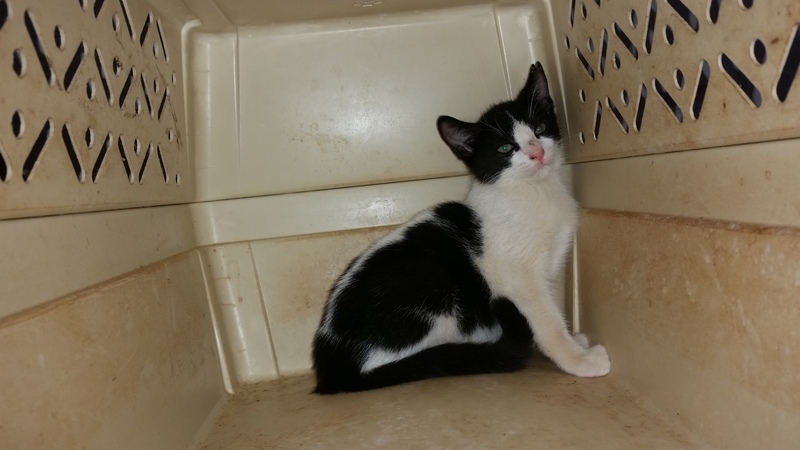 She was previously abandoned kitty. Brownie used to love hanging out in my back patio. She only went home to eat. She didn’t like loud noises so I let her in during the day. Her owners didn’t mind at least they knew she was safe and always knew where she was. She was very friendly and bonded with my parents and me. Later her owners moved and asked me if I would like to keep Brownie because they couldn’t take her with them. Brownie became a permanent member of our family. She was good company for my dad. She used to watch TV with him along with Jamie the turtle and take afternoon naps with him. 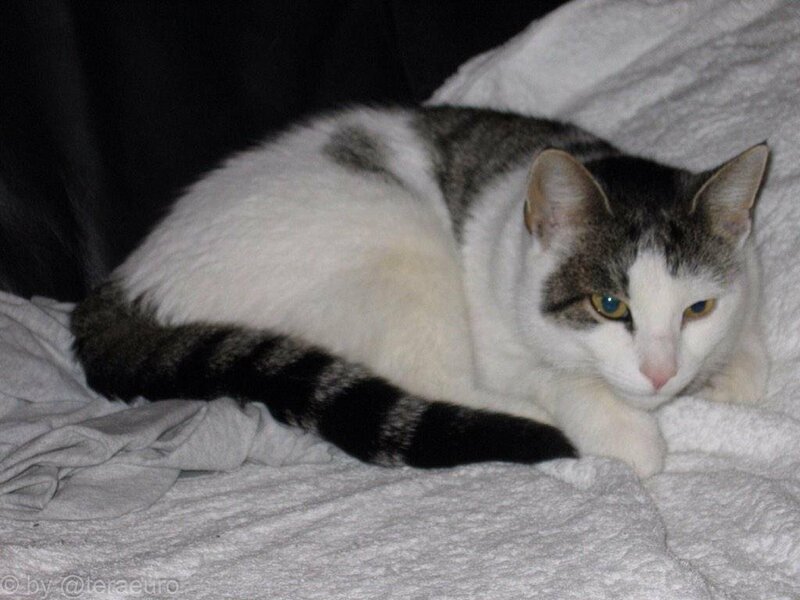 When she became a permanent member of our family she stayed indoors most of the time. Only going out front for a couple of hours. She slept with me in my bedroom. She eventually took over my bed so I slept on the floor:) She would wait for me to get home from work and greet me at the door or my mom would let her out and she would greet me at my car. 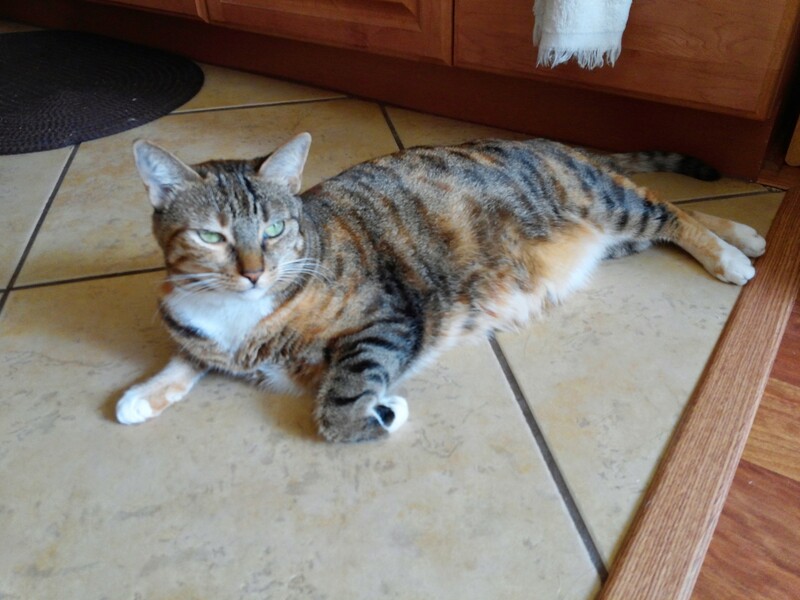 She was a loyal companion and an excellent gecko hunter. She would bring home birds and geckos and make them her pets. Brownie passed away on August 29, 2014 of Cardiomyopathy 😦 . She would have been 6 on September 29 2015. I met Kamalani on October 11, 2014. After Brownie passed away, I wasn’t sure if I would get another kitty. My friend who is a reserve police officer and is on the board of directors at Honolulu Community College stopped by to see me at work. He also takes care of a feral cat colony at the college. He left and a little while later he called and said he had a kitten he wanted me to see. I looked inside the carrier and saw this tiny little kitten. She was so cute ❤ . She let me give her head rubs and that’s when I fell in love with her. My friend told me he stopped by the local humane society and ran into the security guard from the college. He said he found a kitten by the cars and caught her and brought her to the HHS. He asked my friend if he wanted the kitten. My friend thought of me and called me. I think Brownie led him to the HHS that day. My friend lives in the opposite direction and wasn’t going that way when he left my work place earlier. I brought Lani home that evening. She was about 4 weeks old. She was very tiny and cute. She was friendly but shy. It took about 12 days before she finally crawled on top of me. She was very fiesty and had a lot of energy. 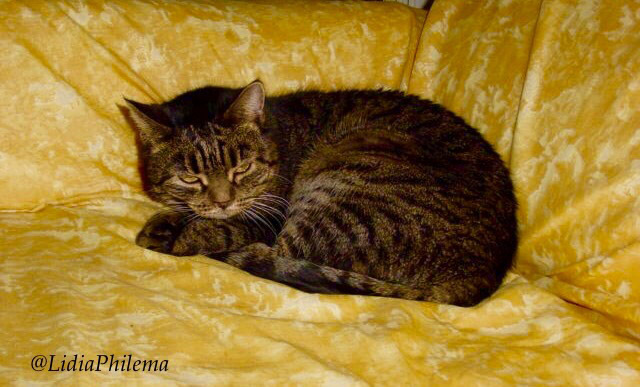 Like Brownie she was an excellent gecko hunter 🙂 . She also was a loyal companion. She loved to wrestle. She also slept in my bed at night:blush: She remained smaller than Brownie by the time she turned 1. Sadly she passed away on September 28, 2015, only Days after turning 1. The first time I saw Kolohe was on October 31, 2015. Another friend, whose wife and coworkers look after a feral cat colony behind their place of work told me, that there were 3 kittens there. They looked so cute. On the night of November 5 he texted me saying that one of the kittens had been caught. He didn’t know which one had been caught and was on its way to get fixed. I asked my angels to give me a sign if this was the kitty for me.Later that night a photo of Brownie that is in the hallway fell off the wall and landed by my bedroom several feet away from where it was on the wall. When I heard the noise, I got up to see what it was and found the picture right side up and Brownie looking at me. I figured that was a sign from my angels that this was the kitty for me. My friend called and I told him I would take the kitten. Didn’t know yet if it was a boy or girl. His wife went to work early to get Kolohe before he was to be released back to his colony. I picked him up from my friend. 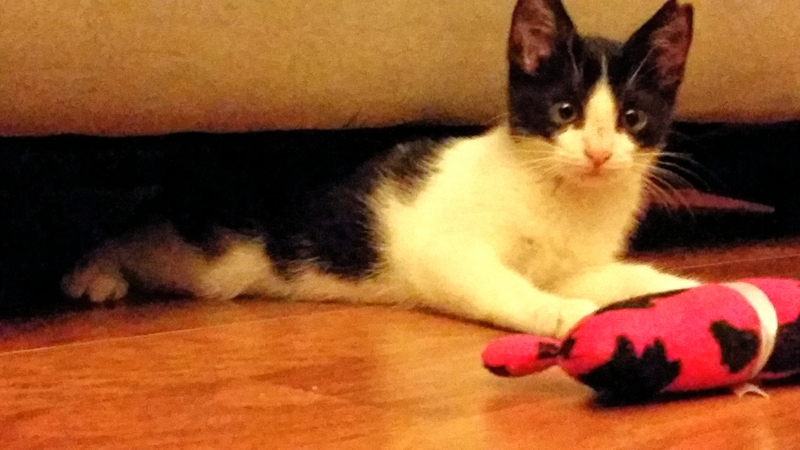 I brought him home on November 6, 2015 :-). I took a picture of him in the borrowed carrier. Didn’t know the flash was on and he was upset. When I looked through the vent hole, he was looking at me with one eye and said softly grrrr:smile: I thought that was cute:smile: . The first night he meowed all night. Thought he was missing his mommy and siblings. The second night I figured out that he just wanted to sleep with me. So I made my bed and slept on the floor for several weeks until he could jump up on the bed. Like Lani he loves to wrestle:smile: But not as rough as Lani. 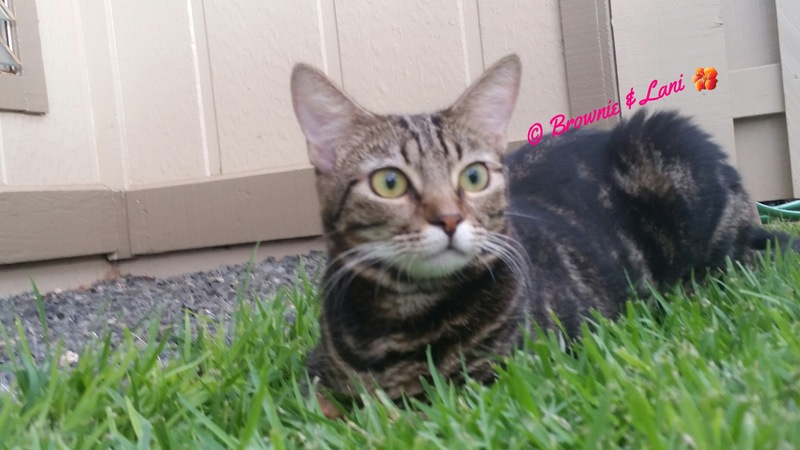 He loves to do zoomies all over the place and outside in the patio where I now live in Waipio Gentry. He adjusted right away and has bonded with my mom and Jamie the turtle. He will get his first checkup, shots and microchipped on January 11. Found a new vet who only does cats:smiley_cat: Kolohe was born in September just like Brownie and Lani ❤ . 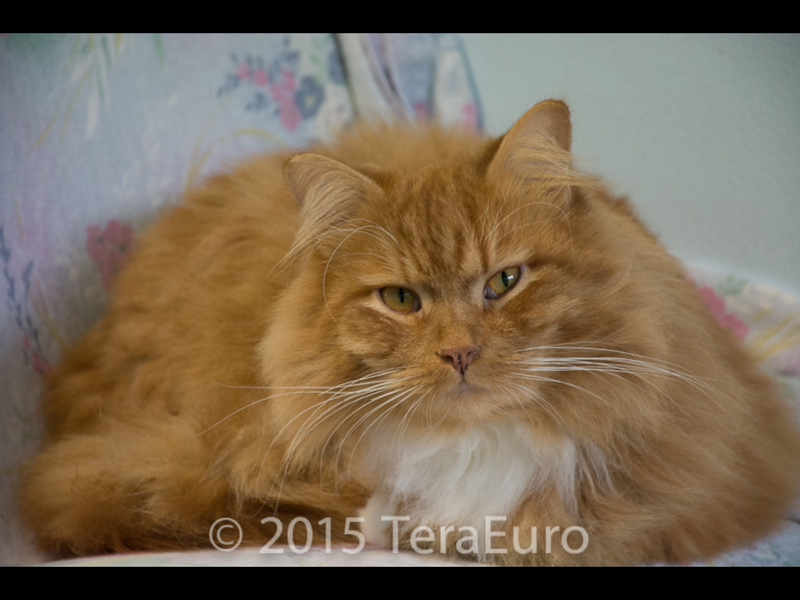 Your cat should be fine, healthy, relaxed or playful for a shot or photo session (and u should be relaxed too). 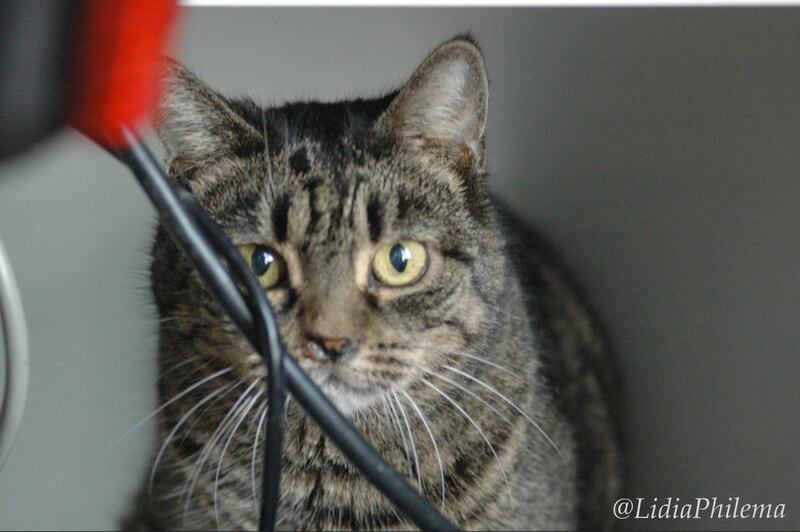 We learned NOT to photograph shy, anxious cats or cats, who are ill (with very few exceptions). 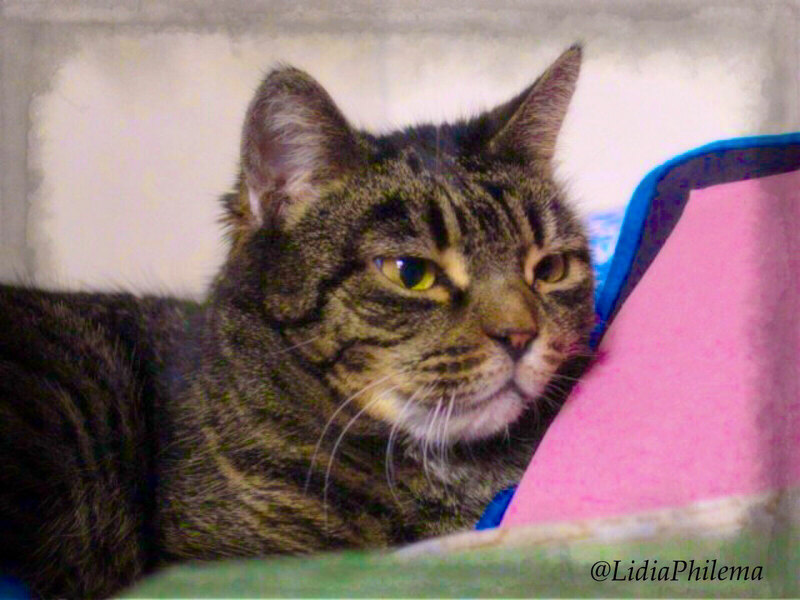 About 3 years ago, Hugodad started his regular shelter visits and shooting lots of cats photos ( of Lady Minky, me and a to of other cats in the shelter, actually the number is several x ten thousands, so we think we write about some experiences from it (Equipment used see below). #1 just start taking pictures of your cat(s), u will get better and more experienced with time (and you will hopefully learn, where and why u “failed” or are not happy with the results). We wanted to start with #2 (see above) smartphones and will talk about pro/contras and some limits of what you can do and expect. Smartphones became quite good as cameras during the last years and many people use them as (the only) camera today. Many smartphones ( and even larger cameras) often have problems with getting a good shot in low light conditions, pictures often can get “noisy” / bad photo quality and often getting a good sharp focus can also be tricky. Best solution (if possible) is try to get more light for your cat models (without switching on flash on your camera smartphone) see #4 . Using Flash to get more light with a flash can be a possible (last IMHO) solution to get a photo, but very often photos are not satisfying (flat look, zombie eyes etc ..). Some cats are also afraid or shocked if u use a flash, so we do not like using flash for cat photography. RTFM or online help, how to switch off flash. We often see blurred (out of focus) pictures, because the smartphone “decided” to do an out of focus shot. Please do not confuse this with a blurred picture from your cat moving too fast, this is/can be a different problem. setting the focus on the iPhone here is just a finger tap to set the focus point. For cat photography there is one simple rule: try to get the focus on the cats eye(s) (for longer distances the nose will work too). RTFM or online help, how to set the focus (if possible) on your smartphone. #6 don´t ask about “the best camera”! the one u have with you ready at your fingertips/paws is best, an expensive DSLR at home won´t help you, if you want to get a shot right now (one of the greatest smartphone advantages). Another consideration: practically no one has unlimited financial resources to always buy a good or best/newest camera (and you will need learning time for a new device too) , get, what can afford and then stop thinking about new equip for 1-2 years and (learn to) use, what u got. That´s it for today, feel free to ask me questions on twitter or in the comment section. 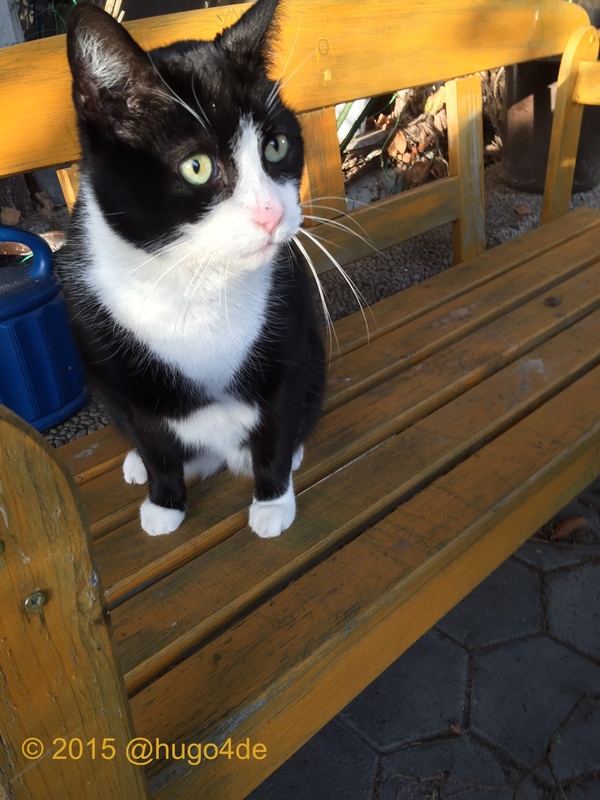 All Photos in this blogpost shot with an Iphone, they may not be purrfect, i just needed some examples, what can be done with a smartphone without major image editing. 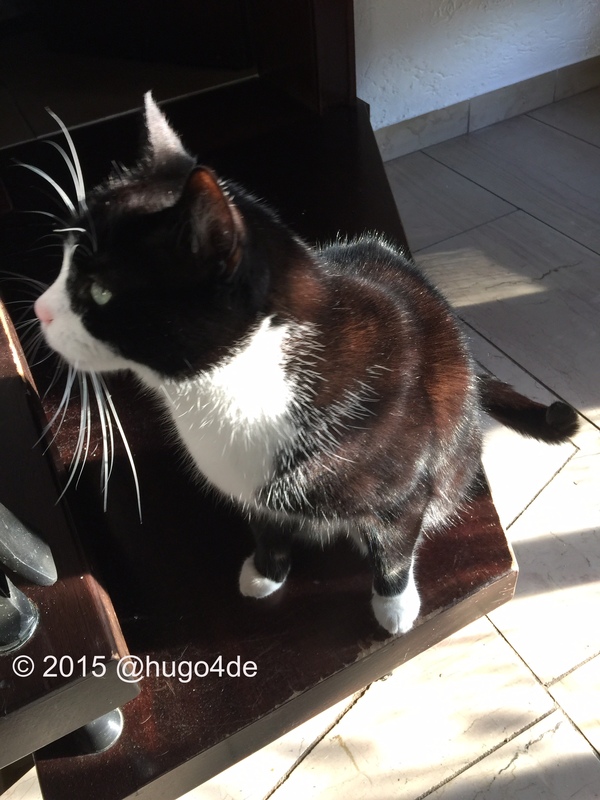 Moin friends, time for another guest blogpost day. 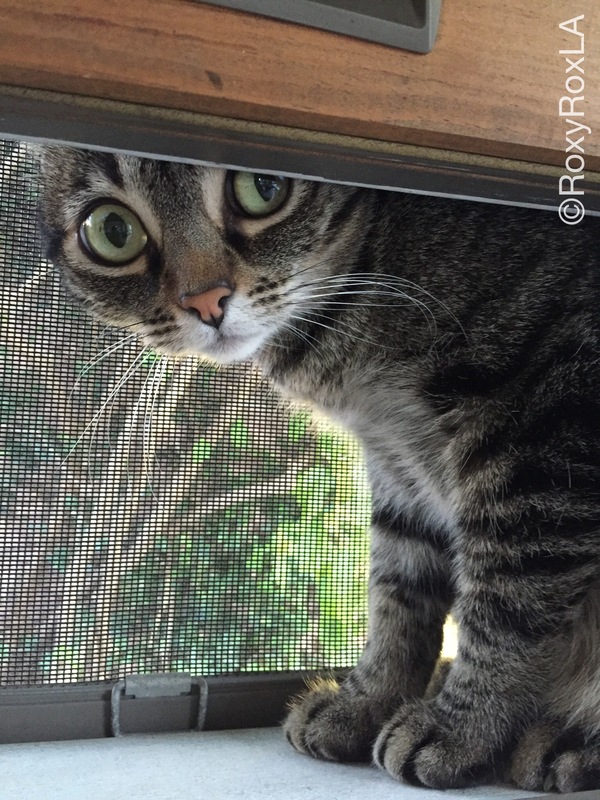 Me is very happy to welcome my twitter friend Roxy here. She send me her adoption story, lovely pics ( and some more;). So let´s start with her story! 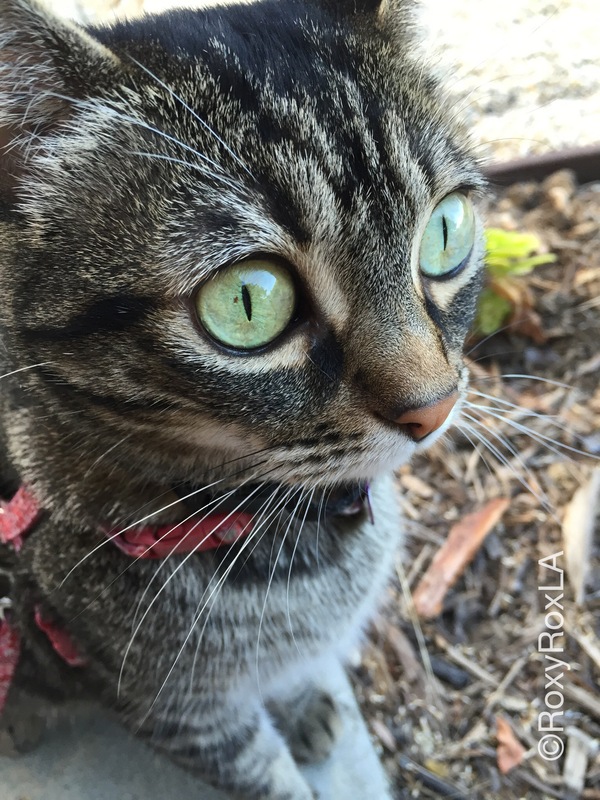 Roxy: My story begins like the thousands of other orphaned kitties in Los Angeles but I consider myself one of the lucky ones, mine has a happy ending. To be honest, I don’t remember my birth mom too much, or my brothers and sisters. 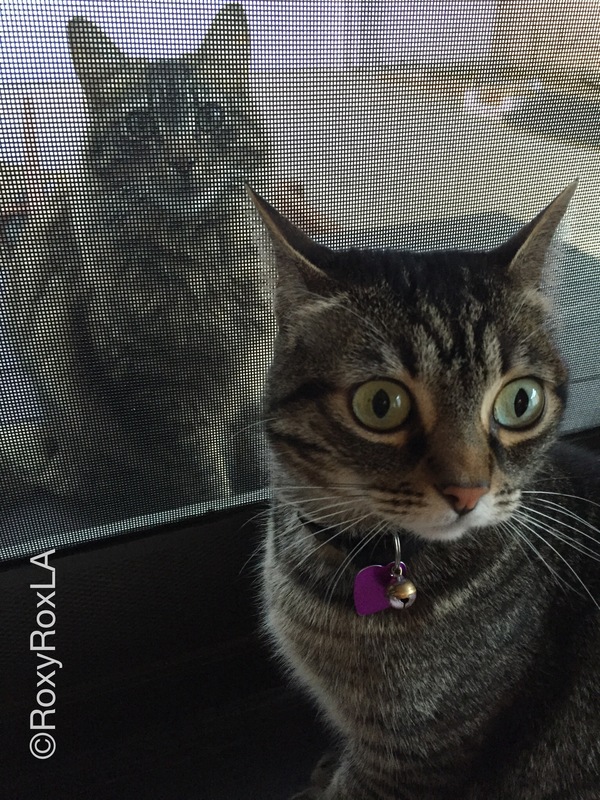 We were born on the streets and it was all my wildcat mom could do to take care of herself, much less the rest of us. She tried her best but I was always so hungry and it wasn’t long before I set out on my own. It’s not easy being on the streets, especially in Los Angeles. I got pretty skinny and my coat was thin. I constantly had to steal food or stand my ground against the other animals I ran across. I even lost part of a canine tooth in one fight! Eventually I wandered on to a golf course. I figured this would be my new home as there were plenty of places to hide but it was easy to see anyone coming up on me. Problem was, I was still so hungry. One day, in early February of 2011, I saw some food inside a strange looking box. I snuck in but as soon as I took a bite, a door slammed shut behind me. I was trapped in a cage with no way out. Eventually a human came up to the trap. I remember him saying “you’re no possum” and he took me to the local animal shelter. 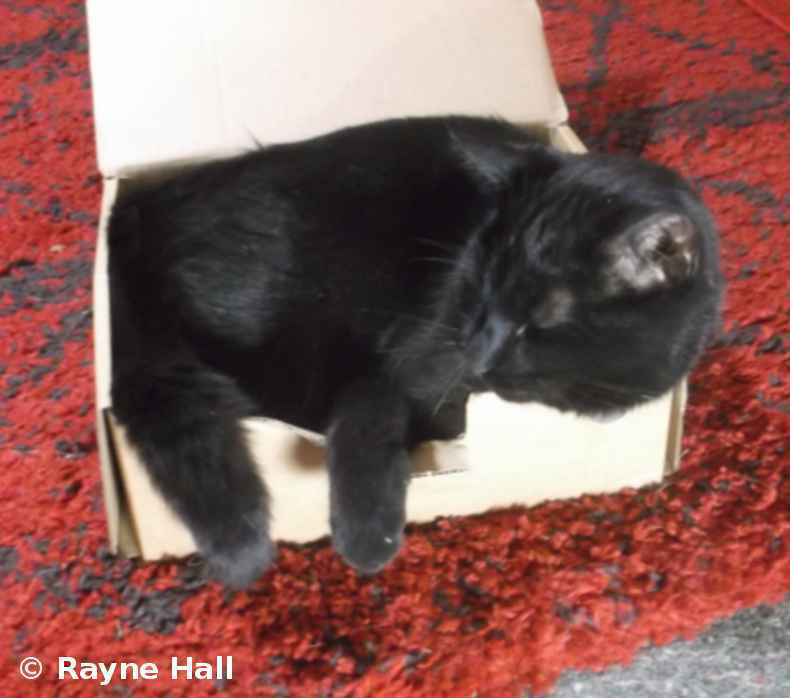 Sharon: When my husband and I moved to our new home we felt a cat was what we needed to complete the household. 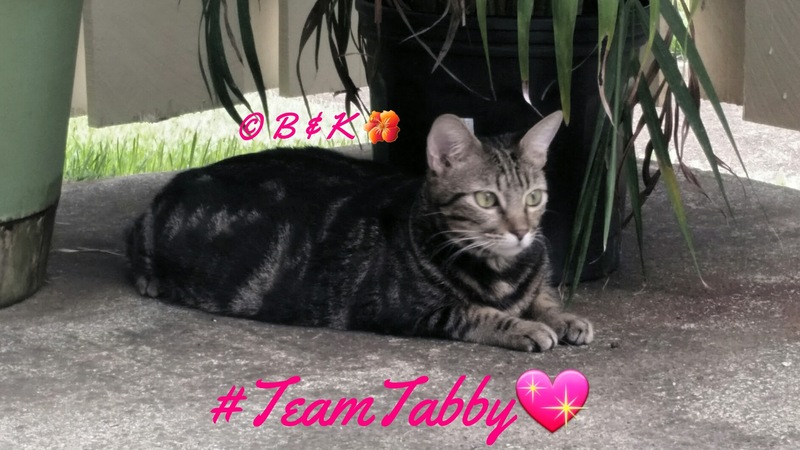 I had in my mind that I wanted a tabby, similar to the one that my sister had so I started searching for one online. I looked through hundreds of photos and found myself wanting all of them. But when I went to see one at the shelter they were either already adopted or I didn’t feel connected to them. Then one day I saw a kitty named “Betty” online and decided I’d go see her. 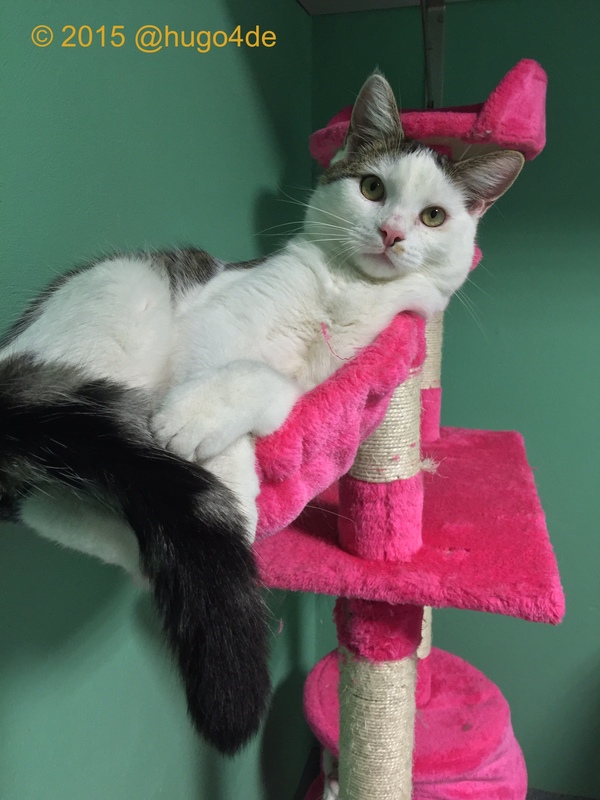 The staff walked me back to the shelter and pointed to her cage on the top row. I walked up and peered into the cage. This skinny kitty came to the front of the cage and put her paw through the wire bars. I reached out and she licked my hand through the cage. Looking at that little face and those big, big eyes – I was hooked. 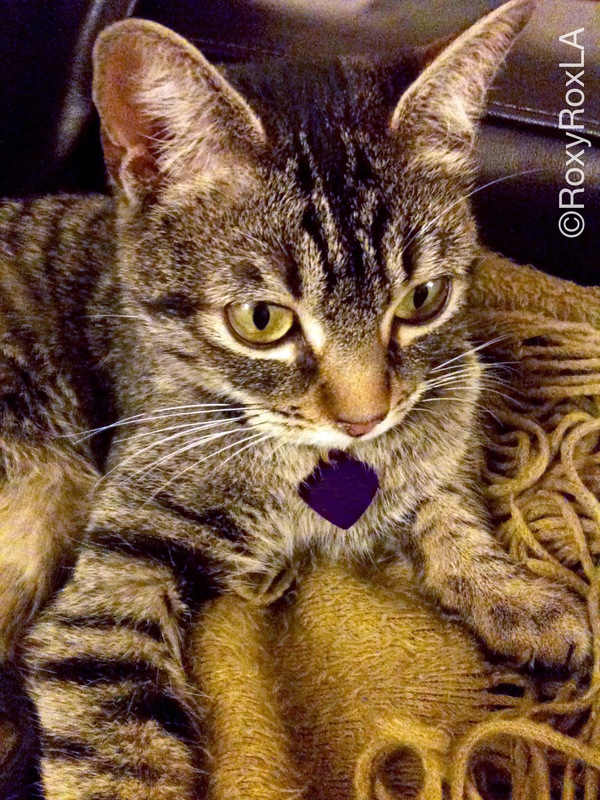 I brought her home and named her Roxy after the music club in Hollywood. Instead of taking me straight home, mom took me to her parent’s house. They put me down and everyone just stared at me. Like I had any idea what to do! But I knew what I wanted – I wanted to eat – and I let mom and her sister know right away. “Feed me” I said but they just looked at each other. So I said it again “FEED ME”. “What’s she want?” mom asked her sister. “I don’t know” her sister replied. “FOOD. I WANT FOOD!” I screamed. “Maybe she wants to eat” mom said and they proceeded to scrounge around until they found a few scraps of meat to give me. Hey, no one ever said love was easy. Eventually mom took me to my new home. 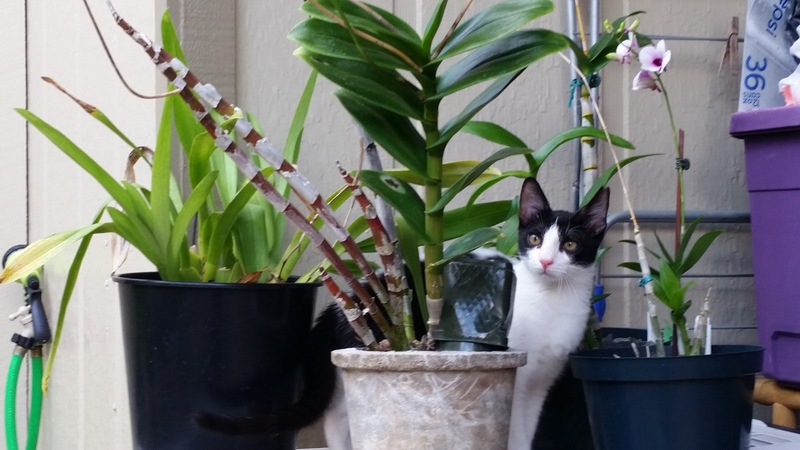 I spent a few hours casing the place out – figuring out a few vantage points to monitor anyone coming or going, finding a few hiding spots in case I needed to escape and, most importantly, figuring out where the litterbox was. At one point I heard mom on the phone. She said, “we’ve got a cat! I named her Roxy.” “Who’s this ‘we’?” I thought. I was kind of under the impression that it was going to just be us two. A couple hours later I heard a car pull up. I quickly ran behind the couch just in case it was someone from the shelter come to take me back. But then I heard mom say “she’s behind the couch” and I saw a man with big blue eyes peer over the edge. I knew right away that this wasn’t somebody come to hurt me – it was dad. I reach up with my paw and tapped him real quick. “She’s so cute!” he said and he smiled down at me in a way I’ll never forget. Ten minutes later I was piled on top of them, purring in joy at my new home and my newfound family. Sharon: And then you sneezed and the cutest little snot bubble came out your nose! Roxy: Yeah, thanks, mom. Thanks for sharing that with the entire world. So anyhow, I spent the next few days figuring out everybody’s routine and trying to get them to understand that there were going to have to be a few changes now that I was there. First thing I had to teach them was what they thought was their bed was actually my bed. And that I sleep wherever I want on my bed. Second thing was that when I say “wake up” you wake up. And finally, you don’t make me wait on my food. I broke into the cupboards a few times when I got hungry and helped myself if they left anything out on the counter. I’ll never live down that time when I got busted licking the frosting off a birthday cake. Anyways, I taught them that running around the house with a shoestring in my mouth meant I wanted to play and that if I gave ‘em my big green eyes, they’d pretty much drop everything and come over and pet me for as long as I wanted. Things were going pretty well and I was shaping them up pretty quick but a couple weeks after they rescued me, both mom and dad had to leave town for a week. They took me to back to grandma’s house. Grandma wasn’t so easy to train. She was horrified that I was such a wild child and called me a “holy terror”. She would have none of my antics so she trained me to stay off the tables and counters with a squirt from the water bottle. I learned real quick and am proud to say that I came back from my stay at Grandma’s as a well behaved young girl – although I still sneak up on the counters when I think Mom and Dad can’t see me. Still hate water bottles though. Just the sight of one will send me scrambling full speed to under the bed. 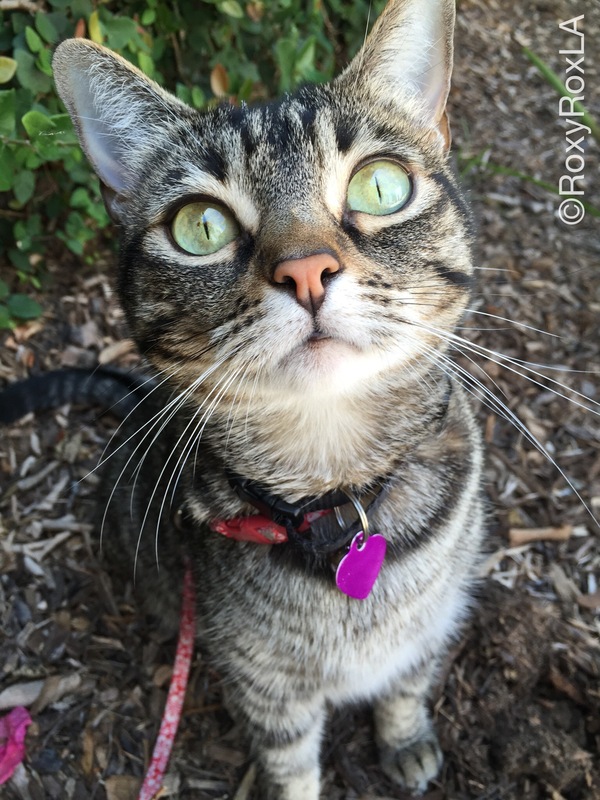 I’ve had lots of adventures in the four years since mom and dad brought me home – many of which I share with all the wonderful friends and furfriends I’ve met on Twitter. From the neighbor boy Scooter to my new duties on Zombie Squad, there’s always something going on! I’ve also come to love mom and dad in totally different ways. Dad protects me and comforts me. I love to ride around on his shoulder while we explore the house together or snuggle up with him for hours when he’s watching the game. Mom is my co-conspirator and also my best friend. She takes me out on my harness for sunny afternoons in the backyard (something about the time I bolted through and open door and ran away for the night really spooked them. Apparently they’ve never heard of a girl’s night out for old time’s sake!) and we play endless games of hunting, chasing and just running around the house. I follow her everywhere and pretty much stay in the same room as her whenever she’s home. Why? Because she’s my forever mom and this is my forever home. I never let her forget how much it means to me that she found me and to anyone reading this who is thinking about adopting a cat, I can only tell you that there’s one out there right now, just waiting for you and hoping you’ll be their forever companion. 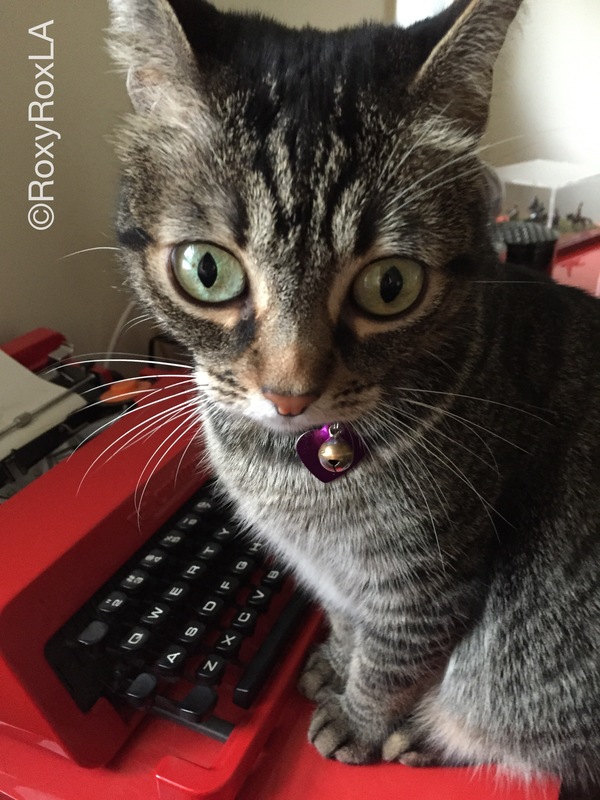 Some Hugi notes: Roxy is very helpful with #unfug hashtag explained! 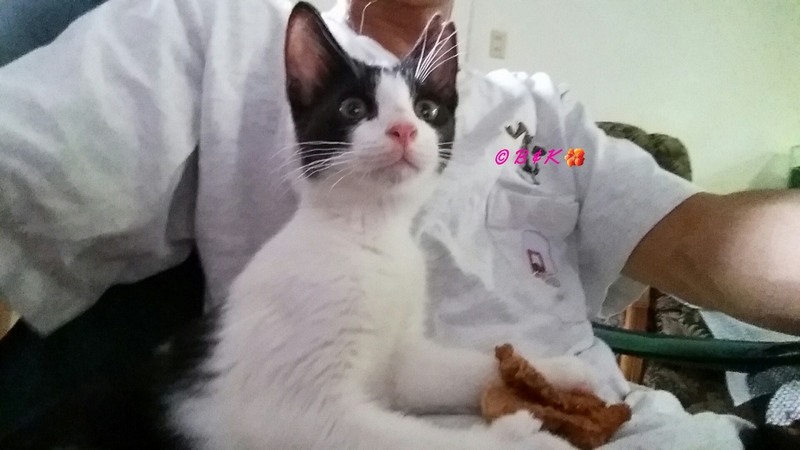 And recently she joined our Zombiesquad #ZSHQ kitty team, so LA should be zombie safe now, great ! 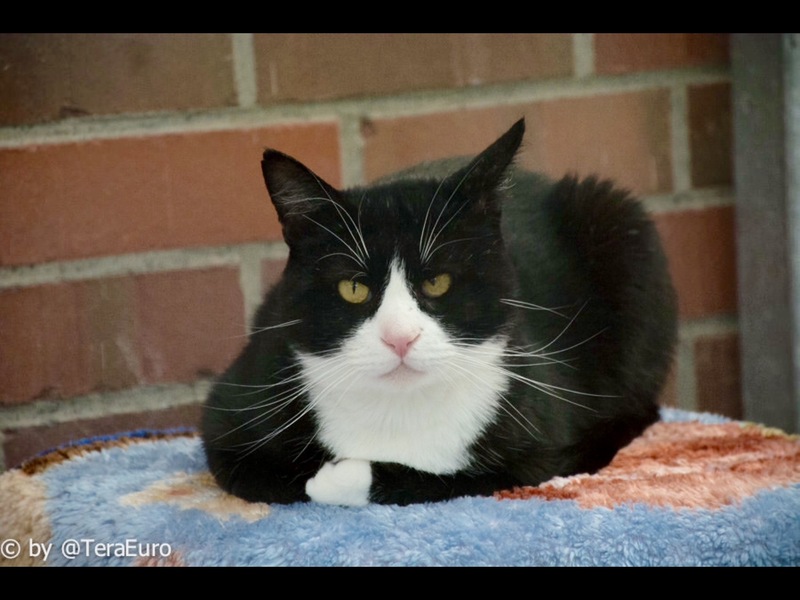 Blogpost day again .. it is a very special day for me today: 2 years ago i met Hugodad for the first time in our shelter. 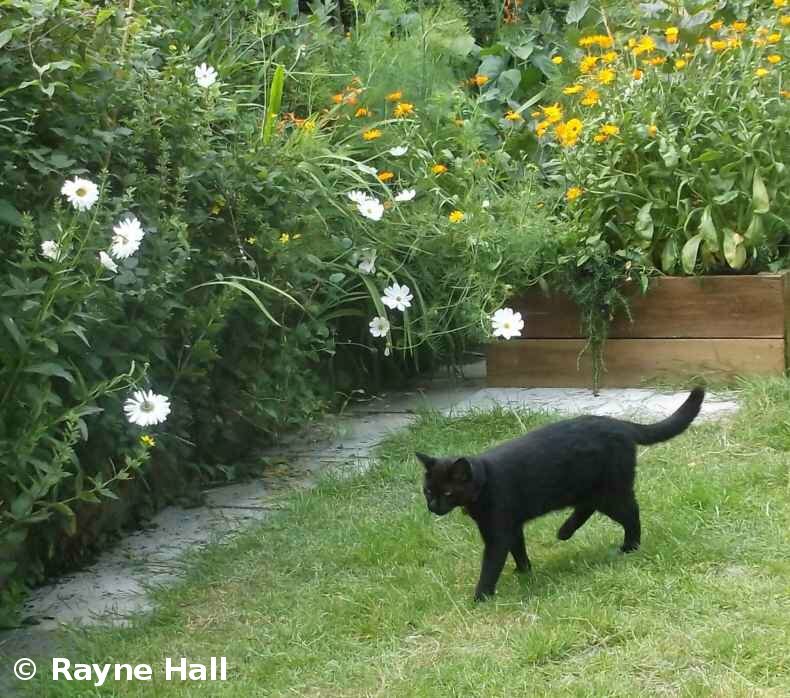 My guest today is Sulu #blackcat and his Mum Rayne Hall telling the story, how he was adopted. 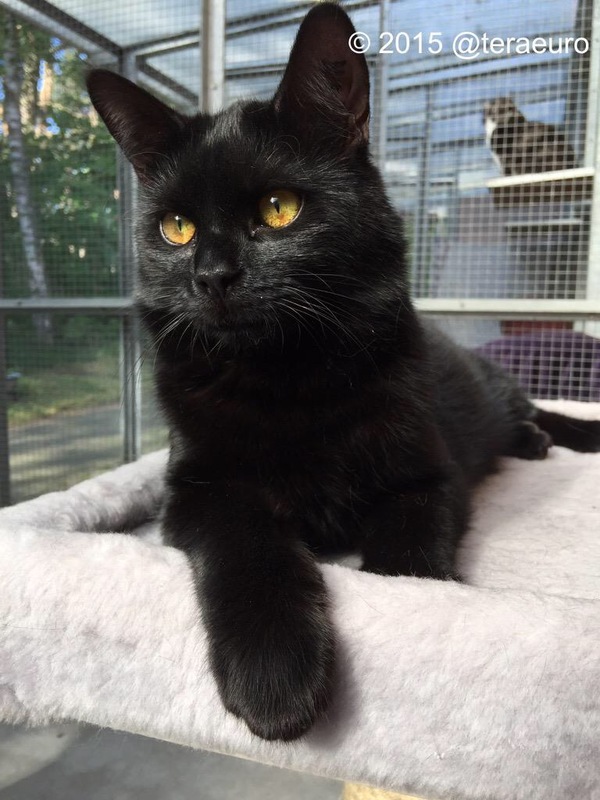 Sulu is a lucky #blackcat, who found a loving home. Black cats often have a very hard time in shelters waiting to be adopted, they are often overseen and some humans even think black cats are/bring bad luck(example from our animal see below). 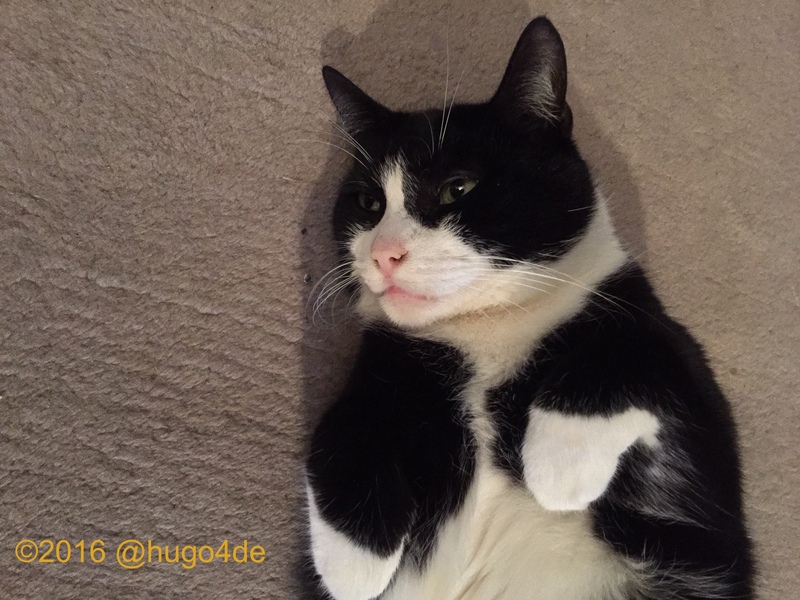 Hugodad grew up with a black cat named “Blacky” – translated – (very long ago) in Cologne and Blacky is still in his heart. Now to Sulu and his story. For many years, I could not have a cat, even though I longed for one. I moved from country to country, lived in bedsits where pets were forbidden, shared a home with a partner who didn’t want a cat. 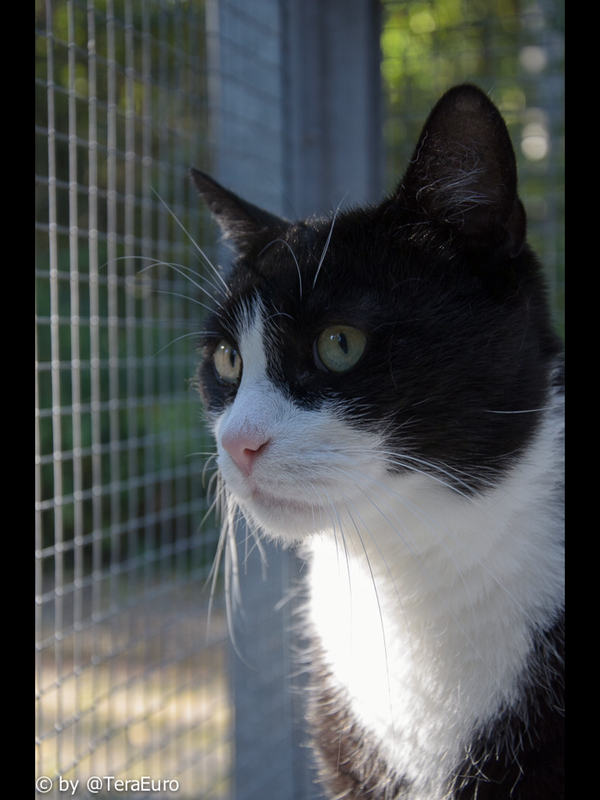 Together with a friend I visited a cat shelter (the Hastings Sanctuary of the Cats Protection). The volunteer who had interviewed me in my home showed us around the spacious kennels. She knew what kind of cat I was looking for (I hoped for a young, intelligent, healthy, black female, though I kept an open mind), but she didn’t do any matchmaking. The sign on the kennel said he was Smokey, male, nine months old, and suitable for any kind of home. 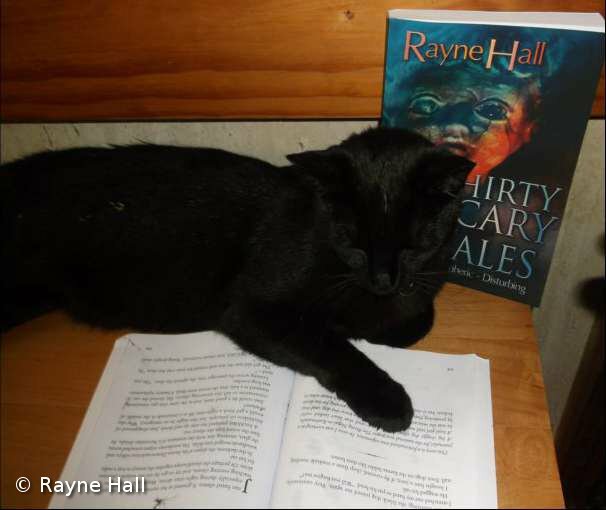 As soon as she opened the door, the little black kitty dashed out into the corridor, but she coaxed him back. “He’s a bit skittish,” she explained, and encouraged me to spend some time with him, so I did. After couple of minutes, he came to sniff at my hands. After five minutes, he allowed me to stroke him, and after ten he didn’t want to let me go again. Still, I went on to view all the remaining cats before returning for a second look at the little black one. He recognised me and was clearly pleased I had come back! This settled it. The cat, the volunteer, my friend and I all agreed on the choice. Smokey (as he was called then) matched almost all my criteria, and the gender of a neutered cat didn’t really matter. I signed the paperwork there and then, and spent the next few days getting everything ready for my new cat. 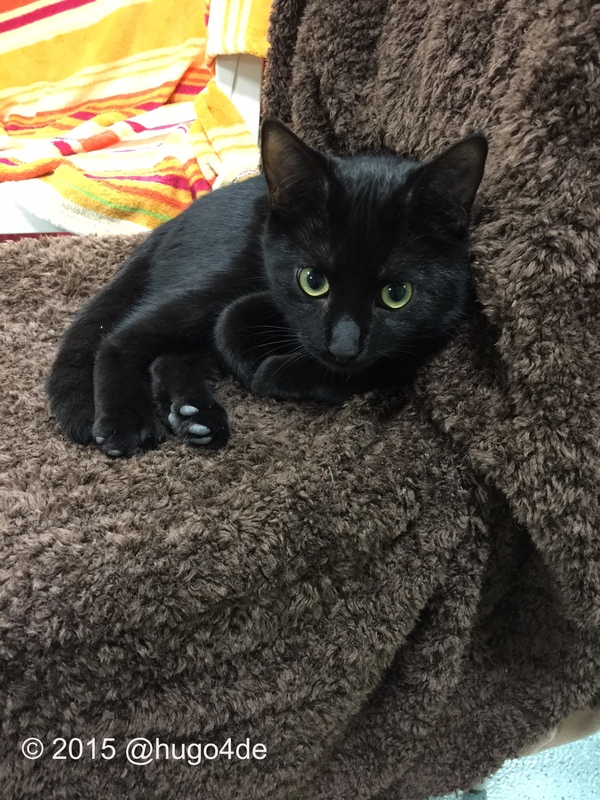 The following week, the volunteer brought Sulu into my home. He dashed out of the carrier and vanished for several hours, but once he came out of hiding he settled in fast, exploring his new home and his human. From the start, I made it my priority to gain his trust, allowing him to progress at his own pace. People often ask me if it was love at first sight for Sulu and me. I’d describe it more as liking at first sight – the real love grew gradually as we came to know each other. 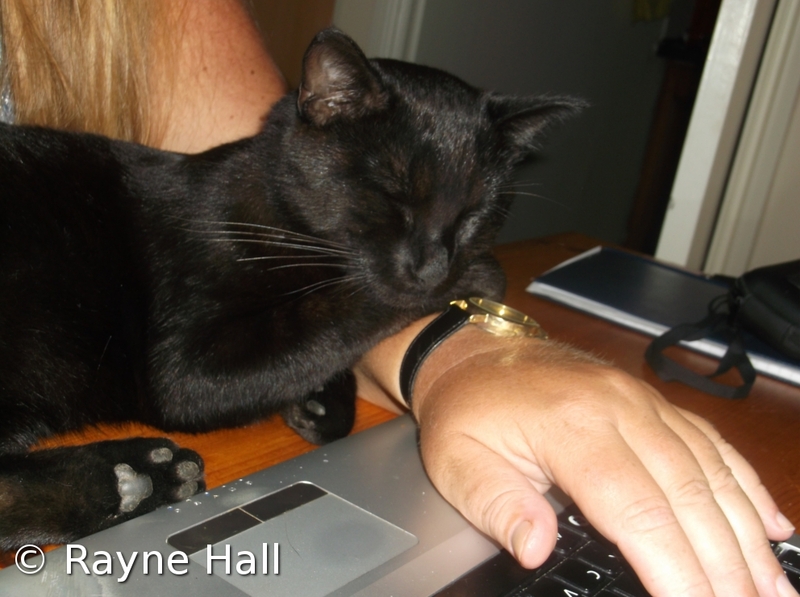 This was the first time in his life that Sulu was being loved. As a kitten he had been a Christmas present to someone who didn’t want a cat. 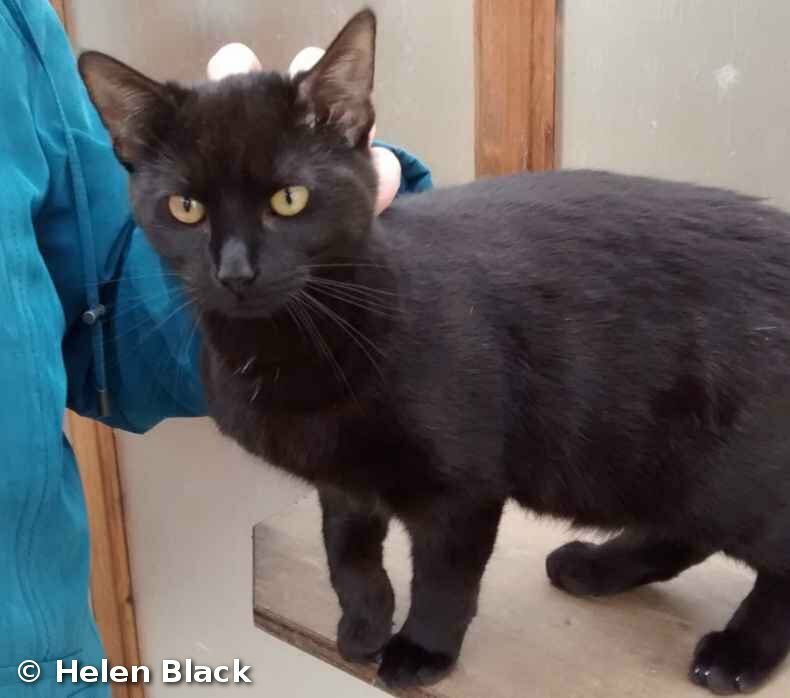 At the shelter, visitors were rare and not keen on a black cat, so he remained ignored for five months. He’s the perfect writer’s cat. When I sit at they keyboard to type, he snuggles between my arms, purring happily. He even loves to ‘read’ my books! 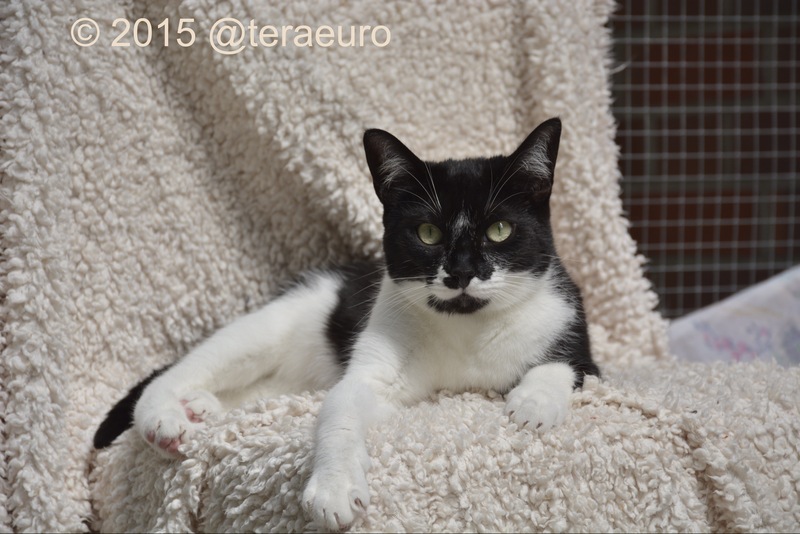 Before adopting Sulu I had initially arranged with a different cat shelter to adopt a pair of kittens. When that fell through, I was frustrated. But in retrospect, I think a higher power arranged everything to bring Sulu and me together. See u later your Hugi! Staff was on a short holiday trip, so we are a little late with our blog. 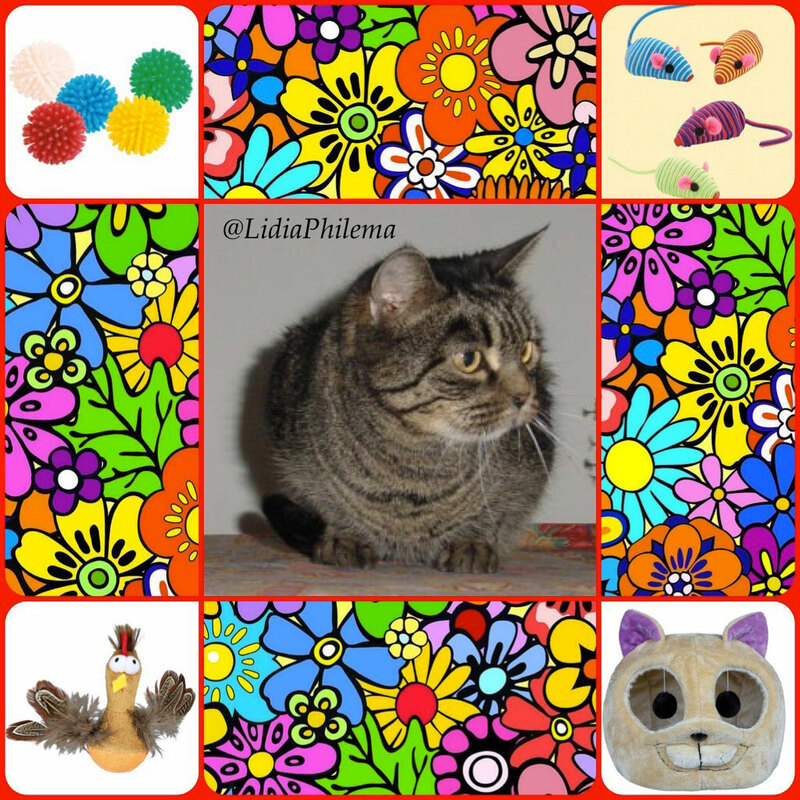 Today we have a guest post by our old twitter friend Lidia. 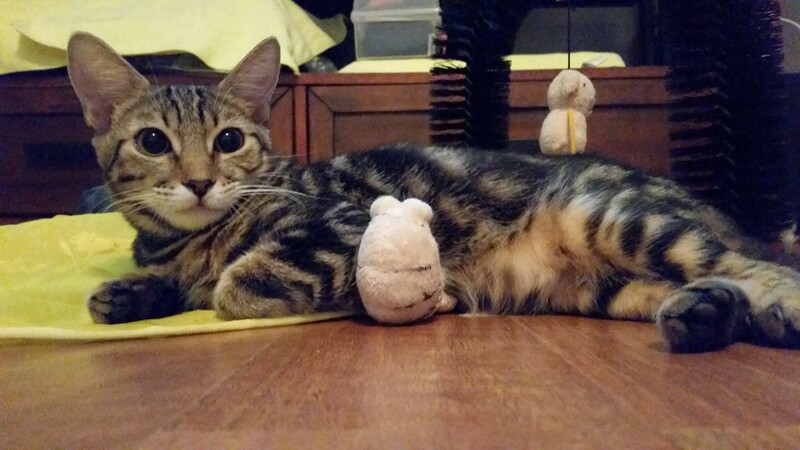 She had (and has) a lot of cats, so we start with a adopted cat named Scricciola. Here we go. 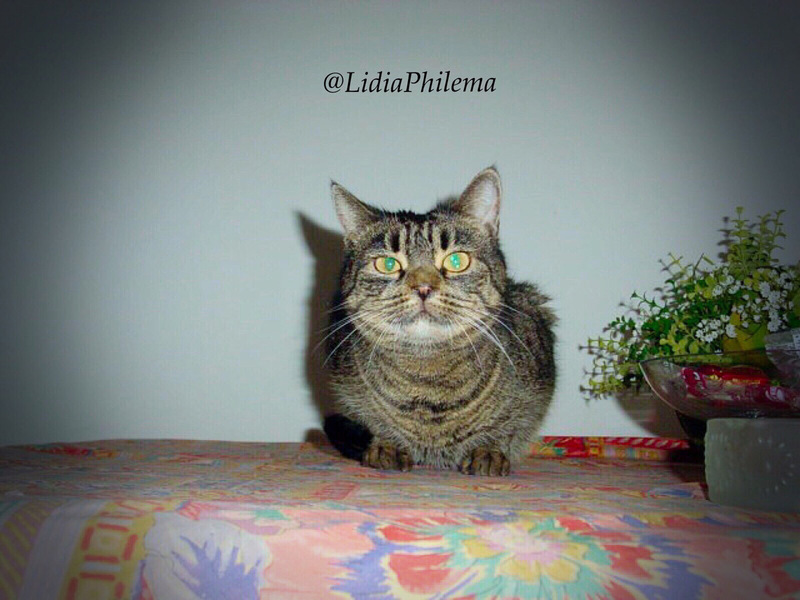 I am @LidiaPhilema on Twitter. In almost 30 years my son and I have rescued several cats, some from tragic situations. 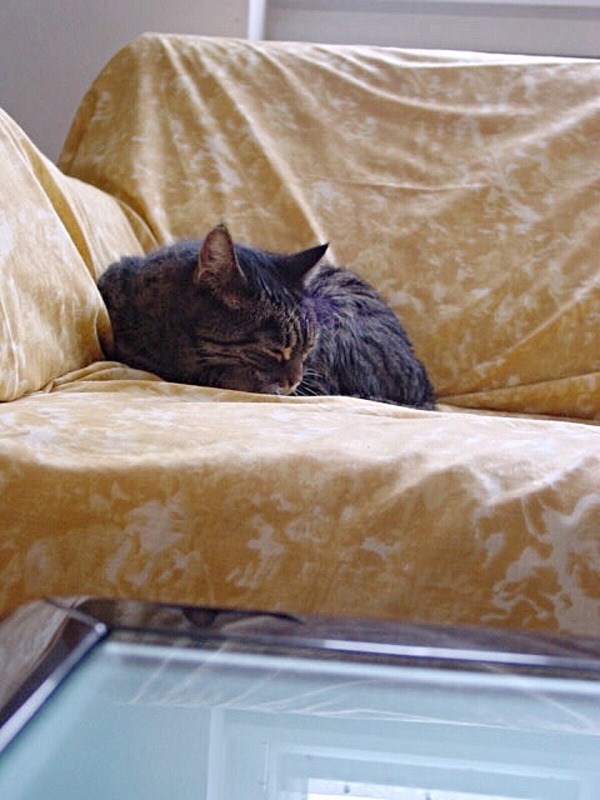 The cat I am going to tell you about is SCRICCIOLA, who became the fourth addition to my feline family nearly 23 years ago. Thanks for your attention and friendship. I am mothertongue italian, so – please – forgive me my Italenglish! Gratitude is not a feline prerogative. At least, not at once. This fact is well known by the thumb of my right hand and, having reached the fine total of eight cats at home over the years and with 30 years of feline experience behind me, by yours truly, too. But way back in 1992, when the cats roaming my house numbered ‘only’ three, I was ignorant of the fact. In any case, it depends on the cat. If they are particularly lively young cats, and still lack confidence, it is better not to expect gestures of affectionate gratitude. A cat is a different animal to a dog: it takes a long time before they place their trust in friend human, perhaps years, during which the human friend must not make mistakes. The test is long and difficult, but the final prize is very rewarding: you are promoted to the rank of “felino ad honorem”, something which (provided you don’t make mistakes) will last a whole lifetime. So, back we go to 1992. One spring day, it was time for the annual vaccination of my three cats. Carried in two different transporters (one single and the other double-sized) we headed for the surgery of “our vet”: Diki, Philema, Paperino and I. One by one they were examined despite their protests, attempted escapes, sudden shyness, hissing and tremors of repressed rage. One miaow, though, rang out louder than the cries of my menagerie. 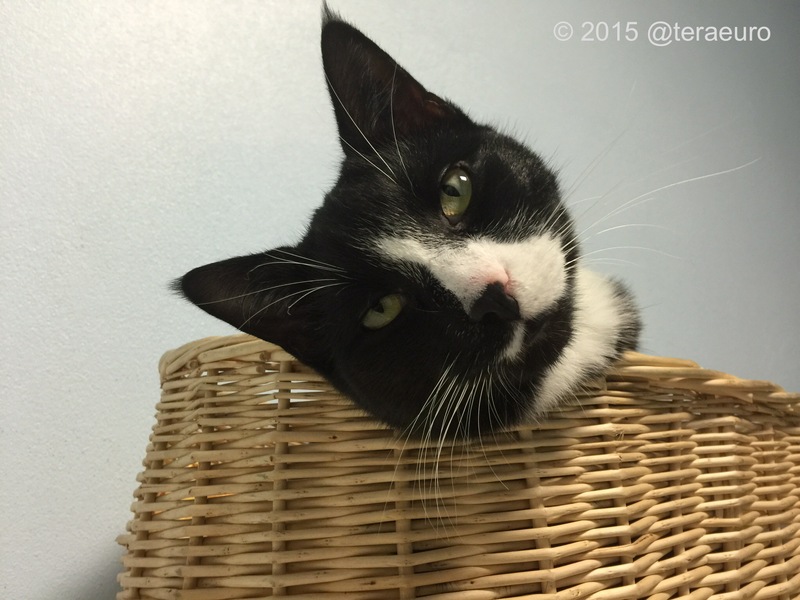 It was coming from a room off the surgery, where the vet was examining the ears and checking the teeth of my cats. The miaow was strident, vibrato, almost a cry for help. “Who is that howling in there?” I asked at one stage. The vet answered: “That’s Scricciola. We operated on her yesterday!” A moment of silence, then my curiosity got the better of me: “Operated for what?” And that, that simple and apparently innocuous question, is where it all started. Because, after the vet’s answer, of course I was no longer the same. 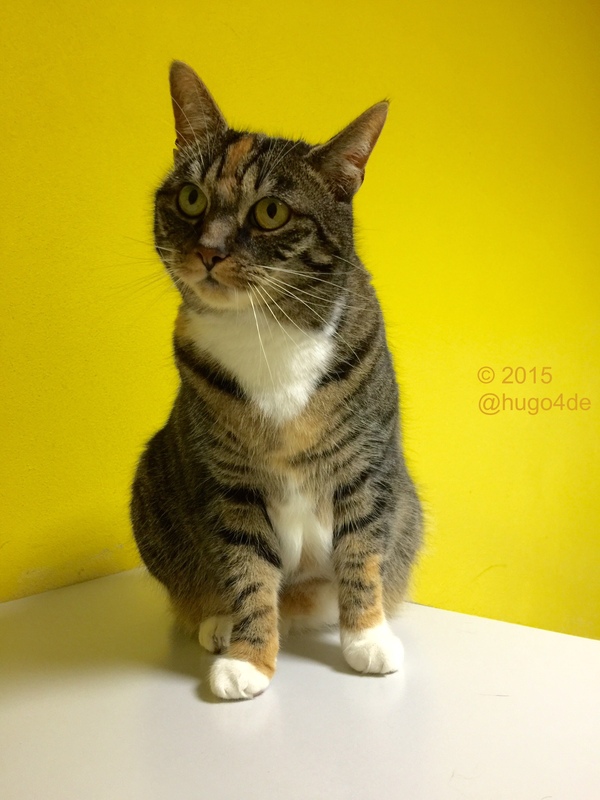 “We had to put a plate in her paw and suture her palate. She was brought in more dead than alive but she’s out of danger now. Some people should be locked up!” The explanation only increased my curiosity and I pestered the vet with a volley of questions. Then I found out that in a certain block of flats the caretaker, in an attempt to get rid of the stray cats living in the garden, occasionally grabbed one and literally flung it off the top floor of the block in question. The building is tall, and most of the animals died. 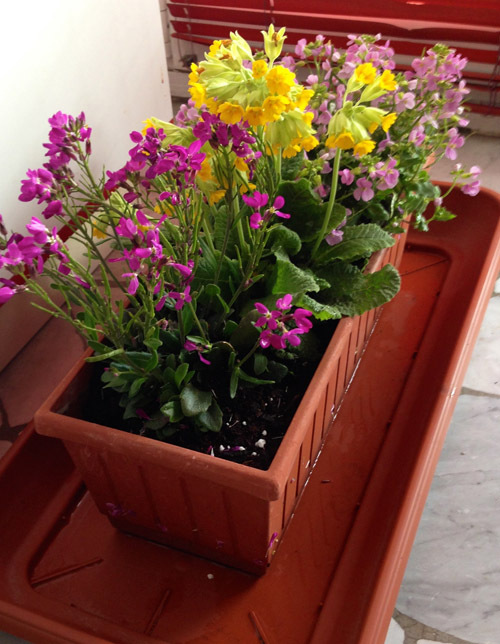 The caretaker believed she had done her duty: she had “cleaned up”, and for sure somebody – in that block of flats – would have said to her “well done! You keep the garden cleaner than anyone!” But not everyone was prey to such cynicism. 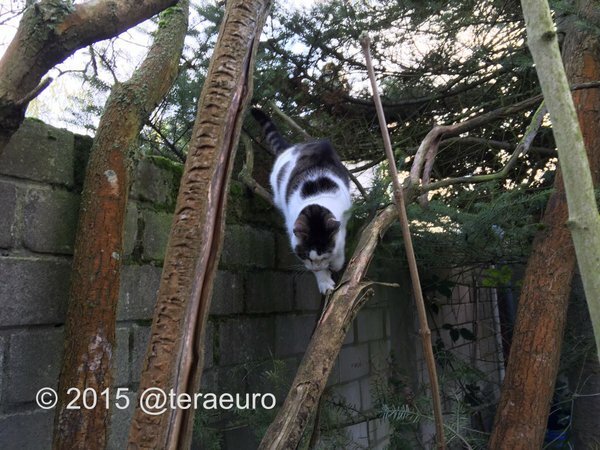 So, somebody grumbled, “that’s no way to get rid of the block cats. What the heck, enough of this barbarism!” When Scricciola was thrown off the roof, that same “somebody” found her and rescued her, then brought her immediately to the vet and paid the cost of her operation. But the person did not adopt her. Meanwhile, though, they reported the caretaker hoping to see the ‘diligent’ coward go through some suffering of her own. The sight that met me filled my heart with sadness. Scricciola was tiny, no more than a couple of months old, the colour of her fur not what you’d call attractive, a dishevelled and dull mousy-grey, and she had a long, mangy tail. The kitten was in a cage, forced into an unnatural position, belly and jaw pressed firmly to the floor. A bubble of blood and snot swelled and shrank at one nostril to the rhythm of her breathing. Her front paws were splayed straight out from her sides. They were sticking out of the transporter through two holes drilled into its two sides. A complicated tangle of elastic bands, bandages and straps was holding the poor animal in that pitiful and obviously uncomfortable position. She looked like a laboratory animal, undergoing some unspeakable torture. Horror rose within me. “But why does she have to stay like that?” I asked the vet who, meanwhile, was handling one of my fat little fellows, with shiny fur and long whiskers. “That paw can’t be moved. The bone was fractured in several places and it has to heal. That’s why we put the plate in her. 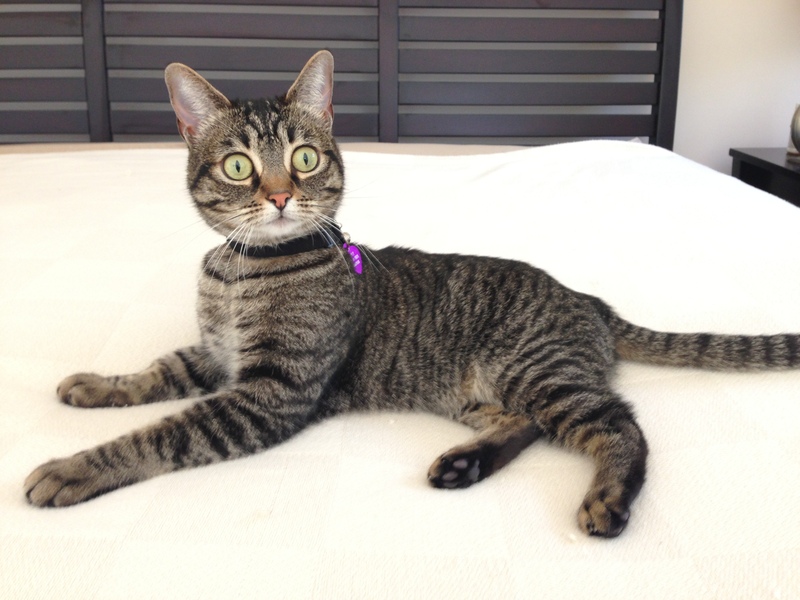 She’s a bionic cat!” And how does this bionic kitten eat? I asked. The vet tells me that she doesn’t eat, she is surviving thanks to the drip. The check-up was over for Diki, Philema and Paperino. As I paid, I came to the realization that I had arrived with three cats that day, but I was soon going to have four. “OK if I drop by tomorrow to see Scricciola?” I asked from the doorway. 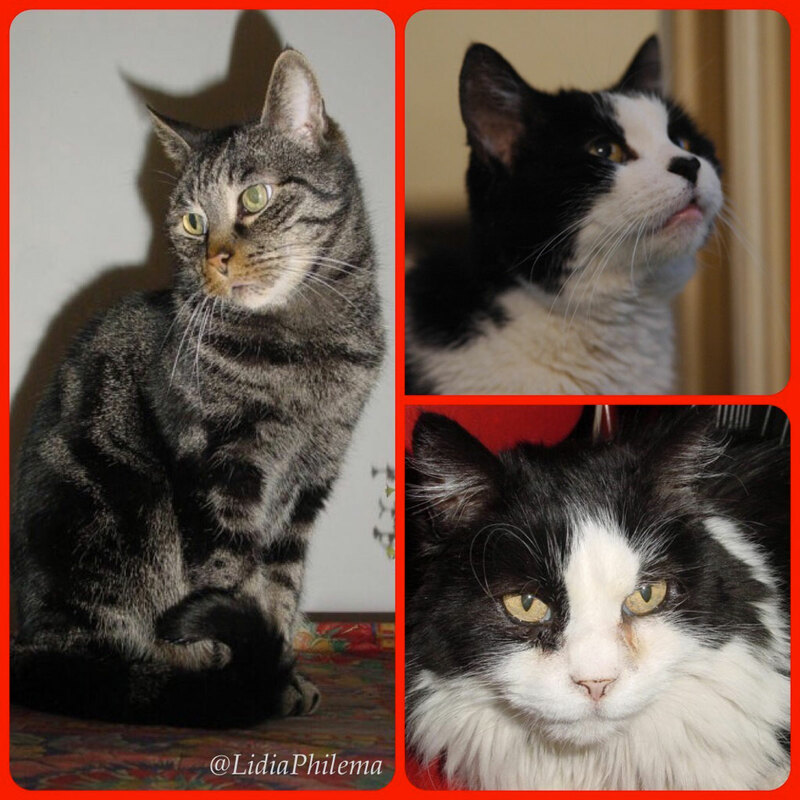 The veterinarian smiled: “but you already have three cats! Think about it. Scricciola is a cat that is bound to have a load of problems. I don’t know if she’ll walk again, or even eat! When she was brought in, her face was all caved in, actually there wasn’t much of it left at all. We had to reconstruct her nasal septum. Do you want to adopt her?” I am confused. “I don’t know, but can I come and see her tomorrow?”. Next day, and the following, and the day after that, and every day for two or three weeks, I went to visit Scricciola. 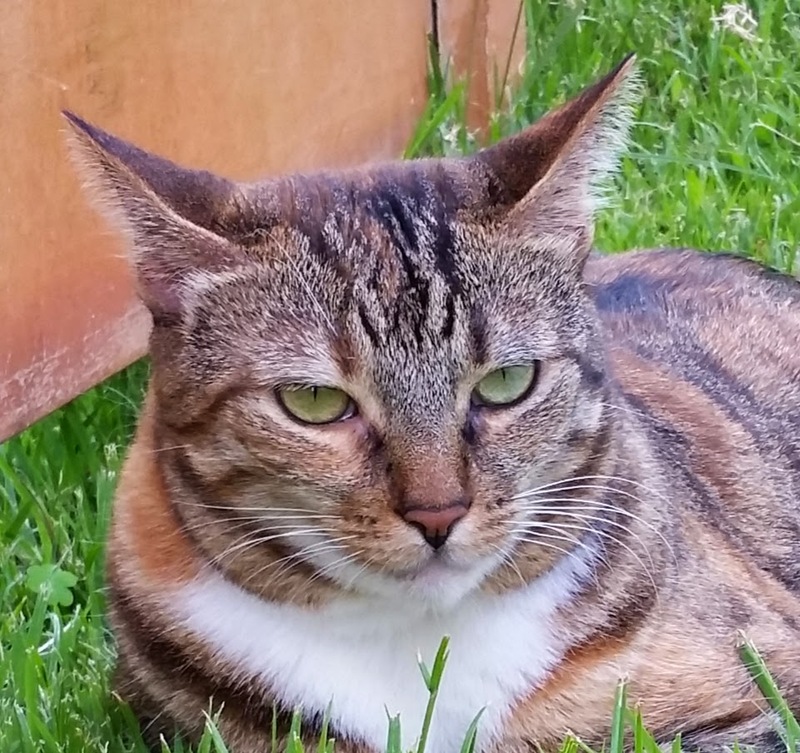 She looked at me and hissed, she didn’t want me to come close and I respected her wishes. I spoke to her in a quiet voice and I didn’t touch her; I crouched down to her level and told her that when she left the surgery, there would be a home waiting for her. Of course, she’d have to deal with three other cats that were twice her size, but – dear Scricciola, I said to her – if you managed to survive the fall from that height, surviving a trio of house cats will be a piece of cake. You’re a female and, mark my words, we females are strong. And we will help you, my son Stefano and I. Chin up! Hang in there and you’ll soon see the doors of paradise opening for you. Finally, the day dawned when I could take Scricciola home with me. The vet gave me a list of dates for a series of check-ups, and once we were home I introduced the kitten into her new environment. Not at all reassured by the fact that she knew me (she had seen me every day for at least three weeks), she scurried off into the bathroom, limping noticeably, and slipped into the narrow opening behind the bidet. From there, she stared at me with wide, terror-filled eyes. And now, pay attention! I am about to make an error of judgement. I expected gratitude from the kitten, that she would show some trust and confidence in me. After all, I had spent time with her, I had respected her pain and shared it with her, I had encouraged her, spoken to her, expressing love and comfort using only my eyes, I had got her used to my face, my smell, and the sound of my voice. She knew that nothing bad would come from me. But whereas on the human calendar, three weeks might be enough to gain the trust of any unknown human patient, on the feline calendar, three weeks is nothing. For Scricciola, less than nothing. 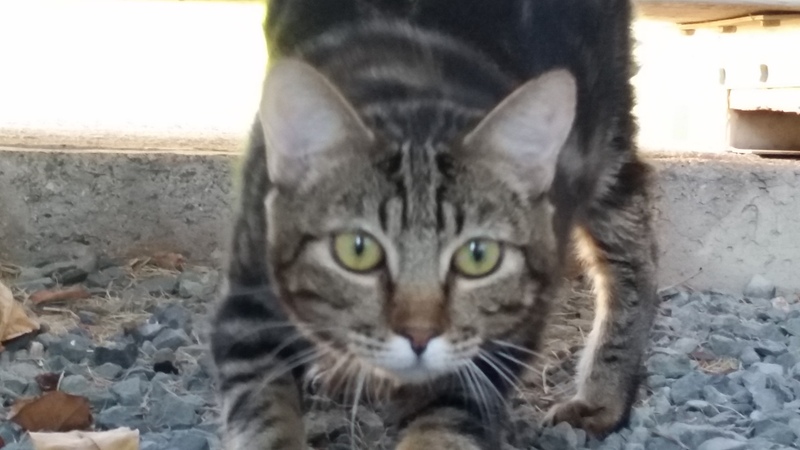 As though seeing me for the first time, she hissed angrily at me, grinding her teeth and flattening her ears back against her head, with the most threatening appearance her little kitten face could conjure up. I paid little heed to this and moved my hand close to pet her and try to bring her out of that uncomfortable place she had chosen. I was sure that I was her friend, but Scricciola hadn’t yet promoted me to the ranks of felino ad honorem and was not prepared to show me her gratitude just yet. Such egoism on my part! And what a formidable lesson I was about to receive! She seized my right hand with canines sharper than razorblades and bit down with all her might. I didn’t want to scare her more than she already was and I tried to detach her from my thumb, which had begun to bleed copiously. But Scricciola’s fangs dug deeper, and she had no intention of letting go. But Scricciola’s fangs dug deeper, and she had no intention of letting go. In fact, she let herself be lifted right off the ground, continuing to bite with all the strength her jaws could muster – which was quite a lot for a cat. They’d fixed her face up well. Those jaws were working a treat. Scricciola had a textbook bite. Then, only when she decided, she let go. Quick as a flash, she darted back into her hiding place, and I examined my hand and thought it best to go to hospital. There they gave me three stitches and a tetanus shot. That was the price I paid for my recklessness, for expecting trust from a cat that couldn’t give it after having been treated the way it had by a human, at least not so soon. For the next five years, Scricciola kept to herself: she never so much as let herself be touched, she ate after the others had finished, and kept out of sight most of the time. Her paw healed quite quickly (by chasing her, my cats had performed a kind of physiotherapy on her), but she never jumped and the high-up surfaces in the house remained the exclusive realm of the first three to arrive. When I had more or less accepted the idea that I had three cats and a four-legged ghost, she showed up one evening and timidly jumped onto the sofa beside me (the sofa was the highest point she could reach with her damaged paw) then she started rubbing against me, wanting to be petted. I was moved almost to tears. Scricciola, the mousey-grey cat, promoted me, even if it took her five long years. I could touch her paw and her face. I did it very delicately. She closed her eyes and purred contentedly. I couldn’t have got rid of her then, even if I wanted to. And the caretaker? She was reported to the police for cruelty to animals. The courage displayed by my kitten and her will to survive helped to keep goodness knows how many other cats free from harm. 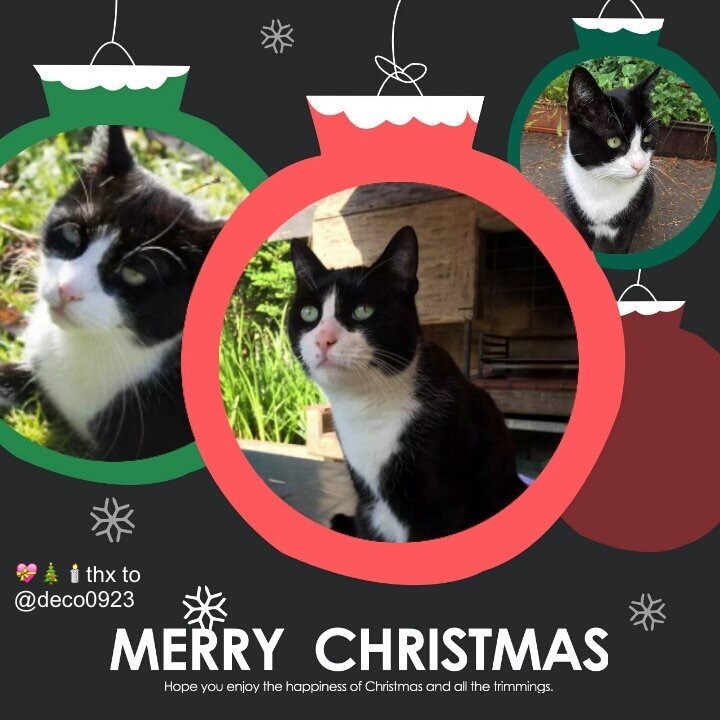 And now Scricciola is #OTRB. 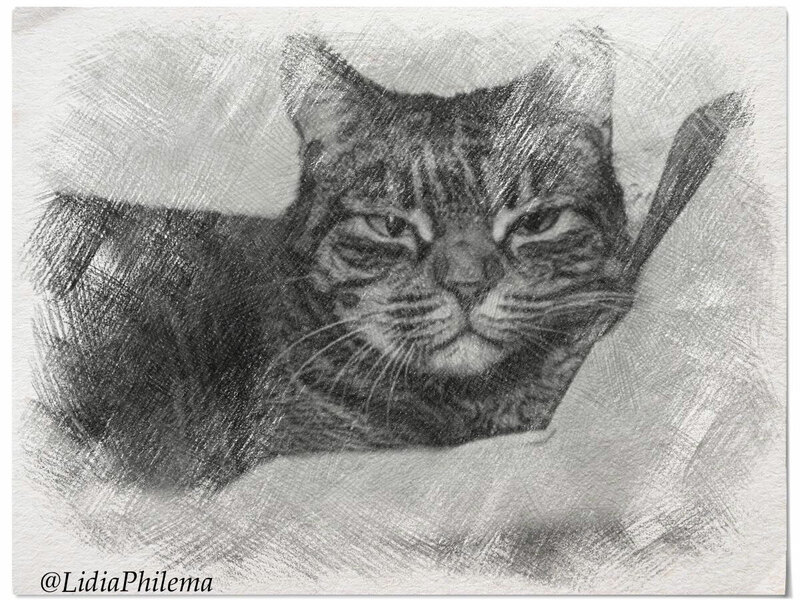 She lived with us for 14 long, love-filled years, with her two odd front paws (one muscular and the other skinny); she underwent another operation on her palate and yet another on her paw (the bionic one), but she was always active and lively, chubby, playful and curious. In a word: happy. I am @LidiaPhilema. Thanks for accompanying me for a part of my life with my cats and with Scricciola.